#WalangPasok ADVISORY for September 18, 2014: All Classes at all levels in Cebu Province and its Cities; Lapu-Lapu and Talisay have been suspended Thursday. Sept 18 due to heavy rains and floods as issued by the Department of Education and Cebu Provincial Government Facebook Page. 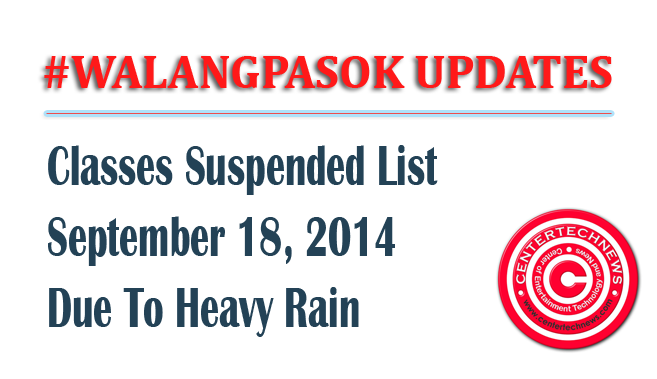 The Class suspension updated as of 10:07 a.m. September 18, 2014. The DepEd also announces that in elementary classes at Naval, Biliran have been suspended while preschool to high school classes in Ormoc City, Leyte also suspended. Classes at all levels are also suspended in Tacurong City, Sultan Kudarat to mark the 131th anniversary of its cityhood and in Zamboanga del Sur class suspension is due to the province's foundation anniversary.